Frank Lettiere's eyebrows and eyelashes froze after his walk along Lake Michigan's Chicago shoreline Wednesday. Frostbite warnings were issued for parts of the U.S. Midwest as temperatures plunged. "I've seen patients develop frostbite within approximately 10 to 15 minutes after being exposed to these extreme temperatures," Dr. Jeff Schaider tells NPR's Ari Shapiro on All Things Considered. Schaider is chief of emergency medicine at the John H. Stroger, Jr. Hospital in Chicago and head of emergency medicine at Cook County Health. Just taking a brief walk outside without a hat can give people frostbite on the backs of their unprotected ears, he says. Frostbite's damage to skin and underlying tissue is the most common injury resulting from exposure to severe cold, and it usually occurs on the body's extremities — fingers, toes, nose, ears, cheeks and chin. The damaged skin typically appears white, waxy or grayish yellow at first, Schaider says, and is cold and numb. Call your health care provider right away if you notice these symptoms or others such as blistering or pain — symptoms that don't resolve within 15 to 30 minutes of being inside. If the condition is caught early, it's possible to prevent permanent damage. If not, frostbite can progress and lead to the need for amputation. Even when dressed for the cold, limit your exposure to five to 10 minutes or so in weather that's minus 10 or colder. An even more dangerous reaction begins when the internal body temperature significantly drops in a condition called hypothermia. Initially when you're exposed to the cold, Schaider says, you'll shiver, and that can be beneficial in trying to keep you warm. But as hypothermia progresses, your body's response to the cold actually diminishes. "You'll stop shivering, and then your body temperature will start dropping at a more rapid rate," he explains. The body gets colder and moves slower. Your mind thinks slower. Your heart moves slower. And as time goes on, he says, you become confused. You can go into a coma or even die. And if you're headed out in a car, Schaider says, be sure to pack additional clothes, a blanket, an extra hat and extra gloves (mittens are best) — just in case something happens to your car. Wet clothes can make you colder. Also, recognize that drinking alcohol may affect your judgment and your physiology. "People who go out and drink might walk outside because they don't feel the effects of the cold that much when they're intoxicated." They might be exposed to the cold for a longer time than is safe in frigid climes, he says, and their body temperature would begin to drop. On Thursday morning, with temperatures hovering around minus 10 in Chicago, Dr. George Chiampas, who specializes in emergency medicine at Northwestern University's Feinberg School of Medicine, told NPR that his city has been prepared for the cold front and that this has helped limit emergencies this week. With schools and many businesses still closed, few cars are on the streets. People who can stay home seem to be heeding the warnings, and that is a good thing, Chiampas says, because it has meant emergency systems, including public health responders, haven't been overwhelmed. First, check the temperature outside. If it is minus 10 or lower, he says, try not to go out. If you must be outside, make sure that all areas of your skin are well covered and that your outer clothing layer is water-resistant. And don't forget to protect your pets. When dogs head out to the snow and ice, they don't understand the danger, Chiampas notes, and will just keep "being themselves." 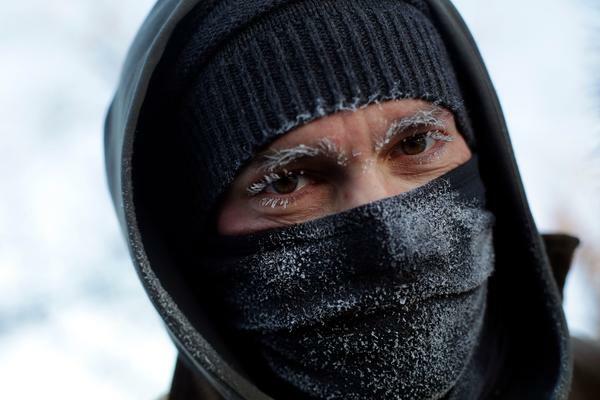 You have to limit their exposure to the cold — even more tightly than you limit yourself — to two to five minutes at most in minus-10 weather, he says. And consider using little booties on their paws for protection. Finally, he says, if your power goes out, get safely to someplace warmer until it comes back on — a neighbor's home or a hotel or shelter. Elderly people and those with chronic illness may be particularly vulnerable to the cold, so check on your neighbors. Now is not the time to tough it out. "These are temperatures and wind chills that many people have never experienced before in the city of Chicago," Chiampas says. One of the things that most concern him: "Sometimes individuals think they can be stronger than the environment."